Did you ever worry about riding in traffic, or got tired of replacing new battery for your bike tail light? Get our Ampulla USB rechargeable bike tail light for you bicycle! Keep safe for your cycling.Now get you and your bike protected by installing AMAZING Ampulla bike tail light. ★ ULTRA-BRIGHT LED BIKE TAIL LIGHT - Ampulla bike tail light has 29 of 85LM LED lights (30lm is common used on other tail lights) & 2 ground lane alert, bright enough to be seen from 150ft away in foggy/rainy day or even in dark night. 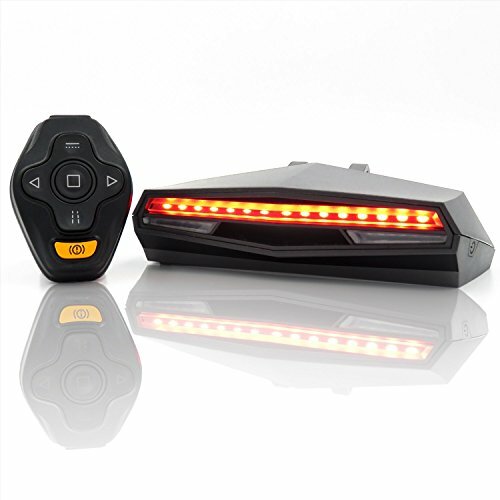 ★ WIRELESS REMOTE CONTROL - Remote control the bike tail light to send signals in different modes by the six easy to use buttons on the wireless controller. ★ RIGHT/LEFT TURNING LIGHT - Simply turn on right/left turn signals through the wireless remote control, emergency lights, and ground lane alert. Get drivers' attentions from several blocks away, securing your safety when riding in traffic. ★ UNIQUE GROUND VIRTUAL LANE - Ultra-bright laser on the ground warns any possible incoming vehicle, giving the rider their own virtual lane, further increasing visibility. ★ IPX4 WATERPROOF - IPX4 Waterproof level can be used in small to moderate rain in the temperature of in -4-140°F -- your best partner for outdoor biking. If you have any questions about this product by Ampulla, contact us by completing and submitting the form below. If you are looking for a specif part number, please include it with your message.